Step 1 - You need to download this picture to your computer. 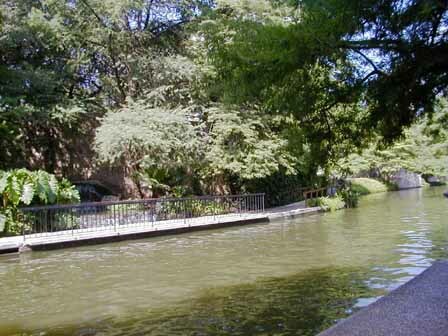 It's a picture of the San Antonio River in San Antonio Texas. I took the picture and I don't mind that you use it for this exercise. In WIN - right click your mouse and save picture in MAC click and hold down your mouse and save picture. Step 2 - Click on this and drag it onto the Stage. Name this layer Background and lock it. Add another layer and name it Frogs. Step 3 - In the Library click on the Frog Graphic Symbol and drag it onto the Stage. Repeat this until you have six or seven frogs.